Menu Creator is a VB 6.0 add-in that work with another my ActiveX DLL to subclassing menu: MenuExtended.dll and, as you see on image below, is used to create your menu without to write any line of code (like as VB 6.0 menu Editor). Multi language support: You may to use your language for Menu Creator user interface. At moment, only Italian and English languages is availables. Easy and quick: What do you do to create a menu? 1.open your project. 2.add a ImageControl with your images (16x16 icon only). 3.start Menu Creator. 4.build your menu with your Images and Descriptions. 5.click to Make Menu button to build the menu. Automatic building of menu and code: once you have create your menu with Menu Creator simply click on Make Menu button and in your project will be build the menu (based on the structure you have set) and will be add all the need code (declarations, functions call, etc.) and a refer to MenuExtended.dll. 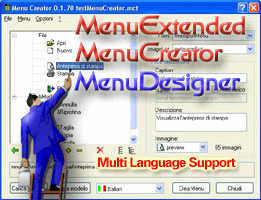 Remeber: the core of all is MenuExtended, not Menu Creator! Automatic reload last menu session (optional): You can reload automatically the last menu you have worked for on the Menu Creator last session. Menu Creator ask, first to load this last menu. Templates: you can save, and reload later, your menu structures, so you don't must re-create each time your menu. You can load a saved menu structure, modify and re-save with other file name. Full manage of menu items: with the arrow buttons, you can move a item as you want (up, down, left, right) to create your menu structure.